2015 has been named the International Year of Soils. Learn how you can get involved at http://www.soils.org/iys. Soil — it’s what’s under our feet. But it’s also what makes sure there is food and water in our stomachs, air in our lungs, clothes on our backs, and a roof over our heads. Soil keeps us from being hungry, thirsty, breathless, naked, and homeless. Besides just growing crops, soil is vital to securing many of the resources that hold the world together. Soil filters water, contains antibiotic-producing bacteria, and provides a stable platform on which to build homes and businesses, to name just a few ways soils are vital to life. However, most people don’t know or understand these unique and plentiful benefits of soils, and soil scientists like David Lindbo have been trying for years to figure out why. He says that without an understanding of the importance of soils, the world’s swiftly increasing population will be at risk as food and water supplies are strained. 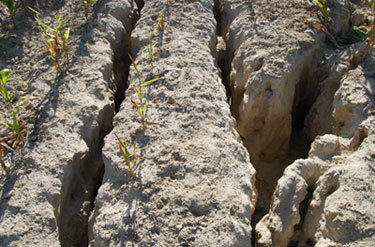 Extreme water erosion in a maize field. Photo courtesy of Borivoj Sarapatka. Soil is strong yet fragile, reliable yet unstable, and resilient yet susceptible to change. These are all especially true when humans and their need for food enter the mix. Large amounts of evidence show soils are declining worldwide because of poor land use practices and soil management. Maps of Texas from the 1960s and 2000s showing different fluoride concentrations at various sites. Red and black dots mark high levels of fluoride contamination (2 – 4 ppm and above 4 ppm, respectively), while gray dots mark low levels of fluoride (below 0.7 ppm). Figure from paper, courtesy of Srinivasulu Ale. Water drips out of almost every facet — and faucet — of Texas. With the state ranking in the top three for groundwater use, it is important for all that water to be clear of contaminants. 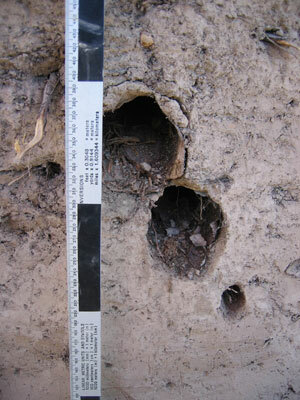 Two larger soil pipe openings discovered at one of the research plots. Photo by Ian Leslie. We go for hikes in the woods to spend time with nature. We look around to appreciate the mammals, birds, trees, grasses, and flowers of the forest. All without a second thought of the soil underneath the dead leaves and pine needles. We’re so busy admiring what we see at eye level that we usually don’t think much of the ground we walk on. But luckily someone does. Scientists at the University of Idaho study what are called soil pipes: horizontal tunnels, or “macropores,” in soil. The presence of soil pipes can affect how water drains or flows through the soil and play a role in soil erosion and hillslope stability. Some of the fungi take very bizarre forms. 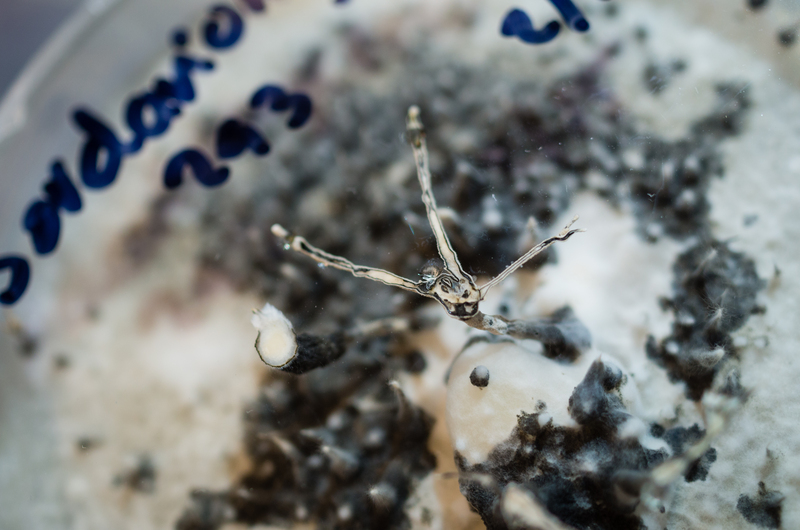 This one grew straight up and began to grip the top of the petri dish. Photo by Alex Wang. 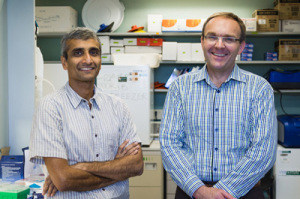 Vishy Iyer, professor of molecular genetics and microbiology, and Matt Cowperthwaite, research director of the NeuroTexas Institute at St. David’s. Photo by Alex Wang.